An expanding line of innovative products designed to help save labor and money. More models and choices so you can get the silo you need. More innovative, user-friendly features and built-in value to help you maintain and protect your stored grain. Top quality performance and classic product durability closely associated with the BROCK® name. Service … from planning to installation … and beyond. Get the differences only Brock provides. Brock's team of professionals also includes a distribution network dedicated to assisting you with innovative, long-term solutions for your operation. Flat-bottom storage silos: diameters ranging from 4.6 to 47.6 meters (15 to 156 feet) and capacities approaching 43,070 cubic meters (1.3 million bushels). Hopper-bottom storage silos: diameters ranging from 4.6 to 10.9 meters (15 to 36 feet ) and capacities from 102 to 1,900 cubic meters (3,080 to 58,000 bushels). Models available with narrow-corrugation (68-mm/2.67-in.) sidewall designs. Brock offers several diameter-based roof options that help balance performance with price. The resulting silo roof peak capacities range from 1,100 to 59,000 kilograms (2,500 to 130,000 pounds) depending on silo model. 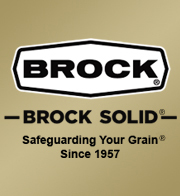 Brock's all-galvanized steel sidewall stiffener is one of the strongest available. All-galvanized steel sidewall stiffener is one of the strongest available. Top quality prime steel sidewall body sheets are 8 through 20 gauge galvanized steel with a tensile strength up to 65 ksi (448 Mpa). On taller models, Brock uses two sidewall panels laminated together for greater strength. Identification codes on every body sheet identify manufacturing date, part number, and steel gauge. Optional Grade 8 polypropylene-encapsulated head bolts provide enhanced corrosion resistance. Silo anchor system securely fastens silo to foundation and is designed to withstand winds up to 145 kph (90 mph). *JS-1000 is not owned or licensed by CTB and is the sole property of its respective owner. Site designed and developed by Digital Hill Multimedia, Inc.